, a celebrated actor, was born in Kingstreet, Covent-garden, the 24th Feb. 1693. His ancestors were of an ancient family in the kingdom of Ireland. 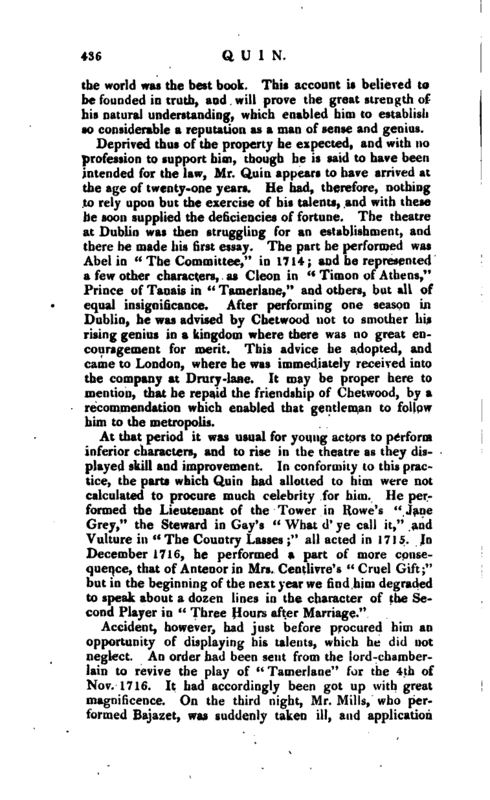 His father, James Quin, was bred at Trinity-college, Dublin, whence he came to England, entered himself of Lincoln’s-inn, and was called to the bar; but his father, Mark Quin, who had been lord-mayor of Dublin in 1676, dying about that period, and leaving him a plentiful estate, he quitted England in 1700, for his native country; taking with him his son, the object of the present article. 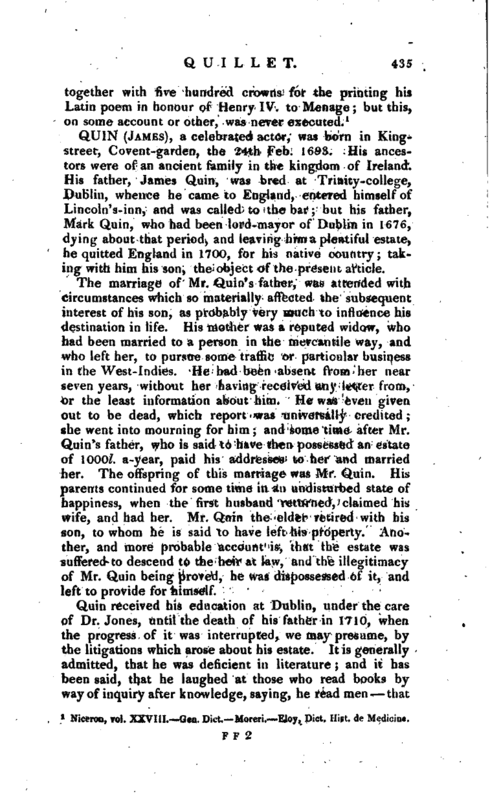 The marriage of Mr. Quin’s father, was attended with circumstances which so materially affected the subsequent interest of his son, as probably very much to influence his destination in life. His mother was a reputed widow, who had been married to a person in the mercantile way, and who left her, to pursue some traffic or particular business in the West-Indies. He had been absent from her near seven years, without her having received any letter from, or the least information about him. He was even given out to be dead, which report was universally credited; she went into mourning for him; and some time after Mr. Quin’s father, who is said to have then possessed an estate of 1000l. a-year, paid his addresses to her and married her. The offspring of this marriage was Mr. Quin. His parents continued for some time in an undisturbed state of happiness, when the first husband returned, claimed his wife, and had her. Mr. Quin the elder retired with his son, to whom he is said to have left his property. Another, and more probable account is, that the estate was suffered to descend to the heir at law, and the illegitimacy of Mr. Quin being proved, he was dispossessed of it, and left to provide for himself. Quin received his education at Dublin, under the care of Dr. Jones, until the death of his father in 1710, when the progress of it was interrupted, we may presume, by the litigations which arose about his estate. It is generally admitted, that he was deficient in literature and it has been said, that he laughed at those who read books by way of inquiry after knowledge, saying, he read men that | the world was the best book. This account is believed to be founded in truth, and will prove the great strength of his natural understanding, which enabled him to establish so considerable a reputation as a man of sense and genius. Deprived thus of the property he expected, and with no profession to support him, though he is said to have been intended for the law, Mr. Quin appears to have arrived at the age of twenty-one years. He had, therefore, nothing to rely upon but the exercise of his talents, and with these he soon supplied the deficiencies of fortune. The theatre at Dublin was then struggling for an establishment, and there he made his first essay. The part he performed was Abel in “The Committee,” in 1714; and he represented a few other characters, as Cleon in “Timon of Athens,” Prince of Tanais in “Tamerlane,” and others, but all of equal insignificance. After performing one season in Dublin, he was advised by Chetwood not to smother his rising genius in a kingdom where there was no great encouragement for merit. This advice he adopted, and came to London, where he was immediately received into the company at Drury-lane. It may be proper here to mention, that he repaid the friendship of Chetwood, by a recommendation which enabled that gentleman to follow him to the metropolis. Accident, however, had just before procured him an opportunity of displaying his talents, which he did not neglect. An order had been sent from the lord-chamberlain to revive the play of “Tamerlane” for the 4th of Nov. 1716—7 It had accordingly been got up with great magnificence. 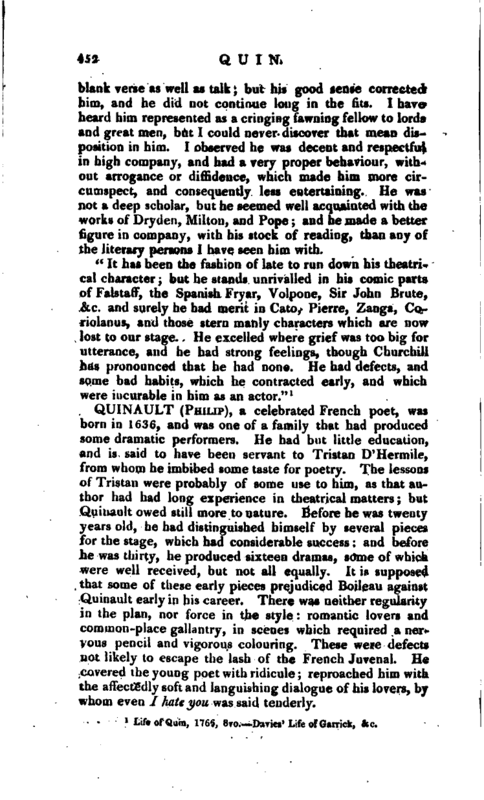 On the third night, Mr. Mills, who performed Bajazet, was suddenly taken ill, and applicatioa | was made to Quin to read the part a task which he executed so much to the satisfaction of the audience, that he received a considerable share of applause. The next night he made himself perfect, and performed it with redoubled proofs of approbation. On this occasion he was complimented by several persons of distinction and dramatic taste, upon his early and rising genius. It does not appear that he derived any other advantage at that time from his success. Impatient, therefore, of his situation, and dissatisfied with his employers, he determined upon trying his fortune at Mr. Rich’s theatre, at Lincoln’s-Inn-fields, then under the management of Messrs. Keene and Christopher Bullock; and accordingly in 1717 quitted Drury-lane, after remaining there two seasons. 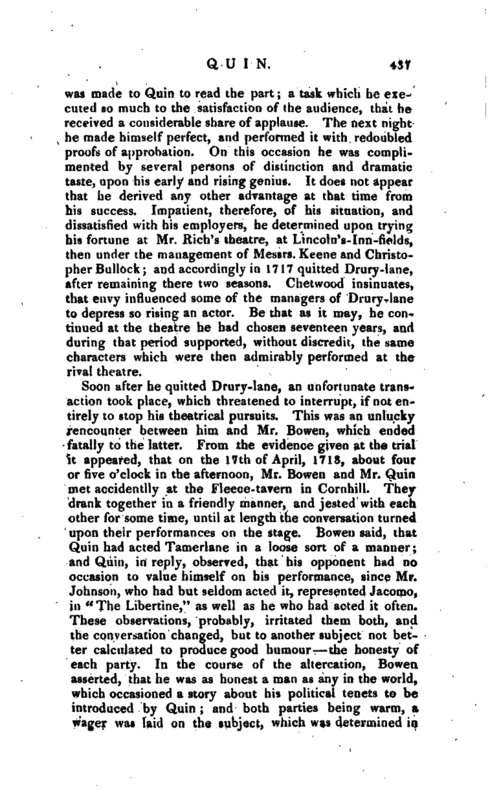 Chetwood insinuates, that envy influenced some of the managers of Drury-lane to depress so rising an actor. Be that as it may, he continued at the theatre he had chosen seventeen years, and during that period supported, without discredit, the same characters which were then admirably performed at the rival theatre. Soon after he quitted Drury-lane, an unfortunate transaction took place, which threatened to interrupt, if not entirely to stop his theatrical pursuits. This was an unlucky rencounter between him and Mr. Bowen, which ended fatally to the latter. From the evidence given at the trial it appeared, that on the 17th of April, 1718, about four or five o’clock in the afternoon, Mr. Bowen and Mr. Quin met aecidentlly at the Fleece-tavern in Cornhill. They drank together in a friendly manner, and jested with each other for some time, until at length the conversation turned upon their performances on the stage. 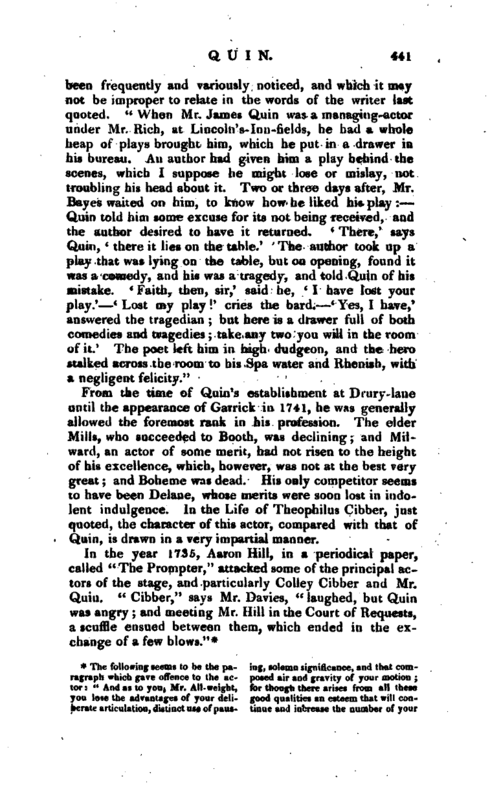 Bowen said, that Quin had acted Tamerlane in a loose sort of a manner; and Quin, in reply, observed, that his opponent had no occasion to value himself on his performance, since Mr. Johnson, who had but seldom acted it, represented Jacomo, in “The Libertine,” as well as he who had acted it often. These observations, probably, irritated them both, and the conversation changed, but to another subject not better calculated to produce good humour the honesty of each party. 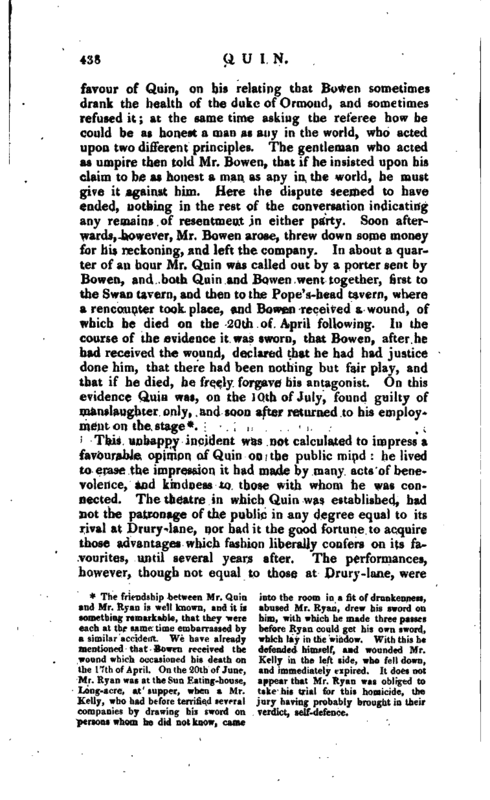 In the course of the altercation, Bowen asserted, that he was as honest a man as any in the world, which occasioned a story about his political tenets to be introduced by Quin and both parties being warm, a wager was laid on the subject, which was determined in | favour of Quin, on his relating that Bowen sometimes drank the health of the duke of Ormond, and sometimes refused it at the same time asking the referee how he could be as honest a man as any in the world, who acted upon two different principles. The gentleman who acted as umpire then told Mr. Bowen, that if he insisted upon his claim to be as honest a man as any in the world, he must give it against him. Here the dispute seemed to have ended, nothing in the rest of the conversation indicating any remains of resentment in either party. Soon afterwards, however, Mr. Bowen arose, threw down some money for his reckoning, and left the company. In about a quarter of an hour Mr. Quin was called out by a porter sent by Bowen, and both Quin and Bowen went together, first to the Swan tavern, and then to the Pope’s-head tavern, where a rencounter took place, and Bowen received a wound, of which he died on the 20th of April following. In the course of the evidence it was sworn, that Bowen, after he had received the wound, declared that he had had justice done him, that there had been nothing but fair play, and that if he died, he freely forgave his antagonist. On this evidence Quin was, on the 10th of July, found guilty of manslaughter only, and soon after returned to his employment on the stage*. 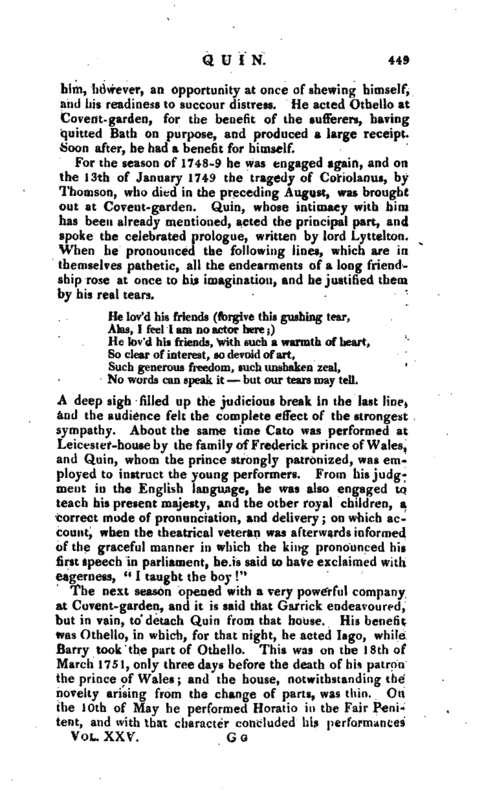 mentioned that Bowen received the defended himself, and wounded Mr.
For a year or more before this period, Lincoln’s Innfields theatre had, by the assistance of some pantomimes, as the “Necromancer,” “Harlequin Sorcerer,” “Apollo and Daphne,” &c. been more frequented than at any time since it was opened. In the year 1728, was offered to the public a piece which was so eminently successful, as since to have introduced a new species of drama, the comic opera, and therefore deserves particular notice. This was “The Beggar’s Opera,” first acted on the 29th of January, 1728. Quin, whose knowledge of the public taste cannot be questioned, was so doubtful of its success before it was acted, that he refused the part of Macheath, which was therefore | given to Walker. 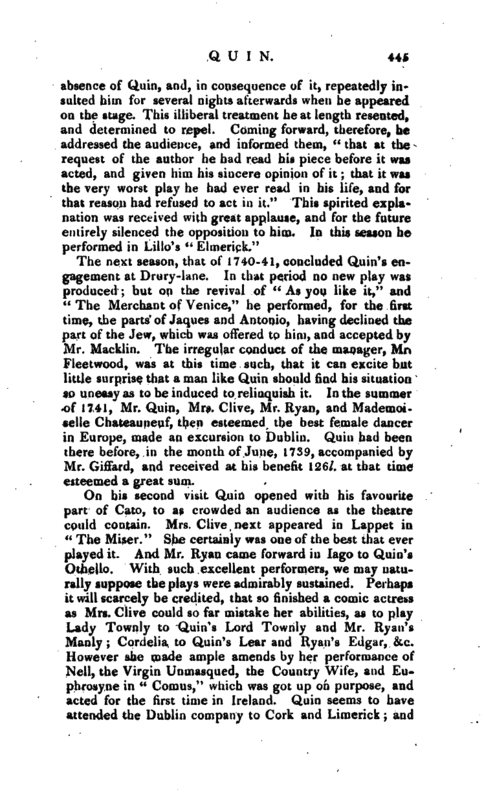 Two years afterwards, 19th of March, 1730, Mr. Quin had the “Beggar’s Opera” for his benefit, and performed the part of Macheath himself, and received the sum of 2061. 9s. 6d. which was several pounds more than any one night at the common prices had produced at that theatre. His benefit the preceding year brought him only 102l. 185. Od. and the succeeding only 129l. 35. Od. 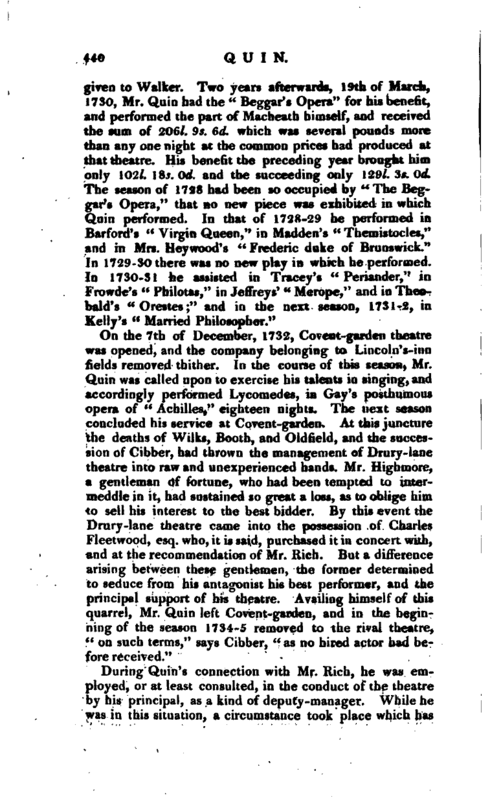 The season of 1728 had been so occupied by “The Beggar’s Opera,” that no new piece was exhibited in which Quin performed. In that of 1728-29 he performed in Barford’s “Virgin Queen,” in Madden’s Themistocles,“and in Mrs. Heywood’s” Frederic duke of Brunswick.“In 1729-30 there was no new play in which he performed. In 1730-31 he assisted in Tracey’s” Periander,“in Frowde’s” Philotas,“in Jeffreys’” Merope,“and in Theobald’s” Orestes;“and in the next season, 1731-2, in Kelly’s” Married Philosopher." From the time of Quin’s establishment at Drury-lane until the appearance of Garrick in 1741, he was generally allowed the foremost rank in his profession. The elder Mills, who succeeded to Booth, was declining; and Milward, an actor of some merit, had not risen to the height of his excellence, which, however, was not at the best very great and Boheme was dead. His only competitor seems to have been Delane, whose merits -were soon lost in indolent indulgence. 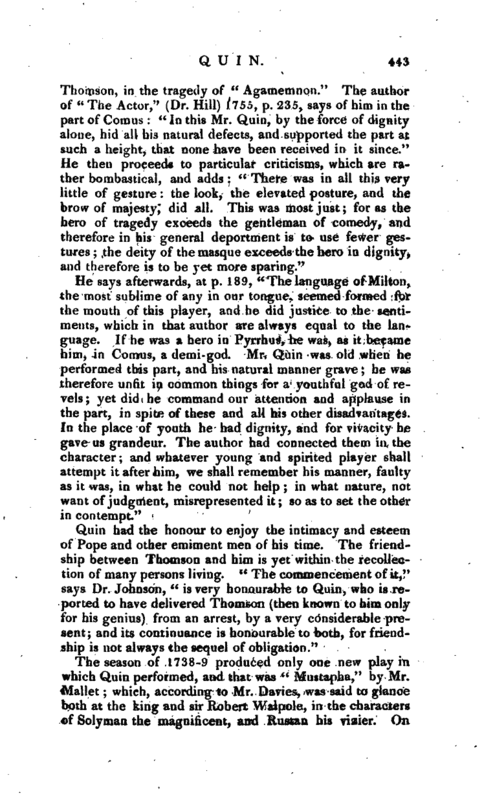 In the Life of Theophilus Gibber, just quoted, the character of this actor, compared with that of Quin, is drawn in a very impartial manner. friends, yet those among them who wish best to your interest, will be always uneasy at observing perfection so nearly within your reach, and your spirits not disposed to stretch out and take possession. To be always deliberate and solemn is an error, as certainly, though not as unpardonably, as never to be so. To pause where no pauses are necessary, is the way to destroy their effect where the sense stands in need of their assistance. And, though dignity is finely maintained by the weight of majestic composure, yet are there scenes in your parts where the voice should be sharp and impatient, the look disordered and agonised, the action precipitate and turbulent;—for the sake of such difference as we see in some smooth canal, where the stream is scarce visible, compared with the other end of the same canal, rushing rapidly down a cascade, and breaking beauties which owe their attraction to their violence." | Quin was hardly settled at Drury-lane before he became embroiled in a dispute relative to Mods. Poitier and Mad. Roland, then two celebrated dancers, for whose neglect of duty it had fallen to his lot to apologize. On the 12th of December, the following advertisement appeared in the newspapers " Whereas on Saturday last, the audience of the theatre-royal in Drury-lane was greatly incensed at their disappointment in M. Poitier and Mad. Roland’s not dancing, as their names were in the bills for the day and Mr. Quin, seeing no way to appease the resentment then shewn, but by relating the real messages sent from the theatre to know the reasons why they did not come to perform, and the answers returned: and whereas there were two advertisements in the Daily Post of Tuesday last, insinuating that Mr. Quin had with malice accused the said Poitier and Mad. Roland I therefore think it (injustice to Mr. Quin) incumbent on me to assure the public, that Mr. Quin has conducted himself in this point towards the abovementioned with the strictest regard to truth and justice; and as Mr. Quin has acted in this affair in my behalf, I think myself obliged to return him thanks for so doing. After this declaration no further notice seems to have been taken of the fracas. A short time afterwards, the delinquent dancers made their apology to the public, and were received into favour. which Quin performed, and that was “Mustapha,” by Mr.
of Solyman the magnificent, and Rustan his vizier. On | the night of its exhibition were assembled all the chiefs in opposition to the court and many speeches were applied by the audience to the supposed grievances of the times, and to persons and characters. The play was in general well acted particularly the parts of Solyman and Mustapha by Quin and Milward. Mr. Pope was present in the boxes, and at the end of the play went behind the scenes, a place which he had not visited for some years. He expressed himself well pleased with his entertainment; and particularly addressed himself to Quih, who was greatly flattered with the distinction paid him by so great a man and when Pope’s servant brought his master’s scarlet cloke, Quin insisted upon the honour of putting it on. 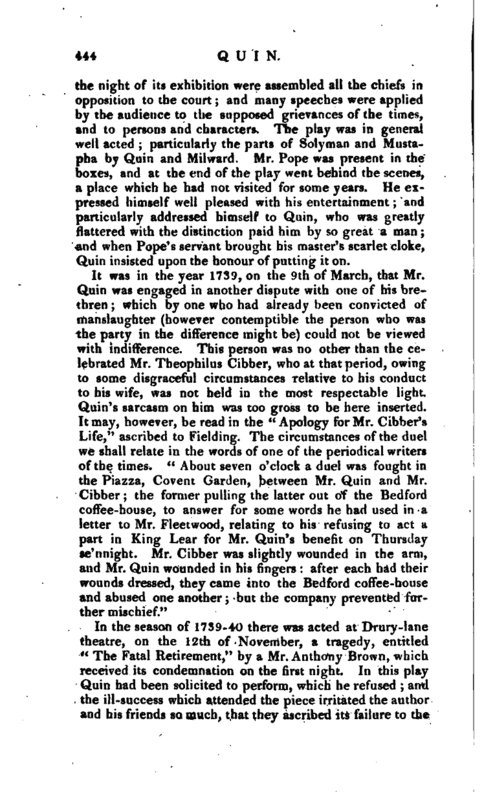 The next season, that of 1740-41, concluded Quin’s engagement at Drury-lane. In that period no new play was produced but on the revival of “As you like it,” and “The Merchant of Venice,” he performed, for the first time, the parts of Jaques and Antonio, having declined the part of the Jew, which was offered to him, and accepted by Mr. Macklin. The irregular conduct of the manager, Mr. Fleetwood, was at this time such, that it can excite but little surprise that a man like Quin should find his situation so uneasy as to be induced to relinquish it. In the summer of 1741, Mr. Quin, Mrs. Clive, Mr. Ryan, and Mademoiselle Chateauneuf, then esteemed the best female dancer in Europe, made an excursion to Dublin. Quin had been there before, in the month of June, 1739, accompanied by Mr. Giffard, and received at his benefit 126l. at that time esteemed a great sum. On his second visit Quin opened with his favourite part of Cato, to as crowded an audience as the theatre could contain. Mrs. Clive next appeared in Lappet in “The Miser.” She certainly was one of the best that ever played it. And Mr. Ryan came forward in lago to Quin’s Othello. With such excellent performers, we may naturally suppose the plays were admirably sustained. Perhaps it will scarcely be credited, that so finished a comic actress as Mrs. Clive could so far mistake her abilities, as to play Lady Townly to Quin’s Lord Townly and Mr. Ryan’s Manly Cordelia to Quin’s Lear and Ryan’s Edgar, &c. However she made ample amends by her performance of Nell, the Virgin Unmasqued, the Country Wife, and Euphrosyne in “Comus,” which was got up on purpose, and acted for the first time in Ireland, Quin seems to have attended the Dublin company to Cork and Limerick and | the next season 1741-42, we find him performing in Dublin, where he acted the part of Justice Balance in “The Recruiting Officer,” at the opening of the theatre in October, on a government night. He afterwards performed Jaques, Apemantus, Richard, Cato, Sir John Brute, and Falstaff, unsupported by any performer of eminence. In December, however, Mrs. Gibber arrived, and performed Indiana to his young Bevil and afterwards they were frequently in the same play, as in Chamont and Monimia, in the “Orphan” Comus and the Lady, Duke and Isabella, in “Measure for Measure” Fryar and Queen, in 1 “The Spanish Friar;” Horatio and Calista, in the “Fair Penitent,” &c. &c. with uncommon applause, and generally to crowded houses. The state of the Irish stage was then so low, that it was often found that the whole receipt of the house was not more than sufficient to discharge Quiri’s engagement and so attentive was he to his own interest, and so rigid in demanding its execution, that we are told by good authority he refused to let the curtain be drawn up till the money was regularly brought to him. He left Dublin in Feb. 1741-2, and on the 25th of March assisted the widow and four children of Milward the actor (who died the 6th of February preceding), and performed Cato for their benefit. On his arrival in London he found the attention of the theatrical public entirely occupied by the merits of Mr. Garrick, who in October preceding had begun his theatrical career, and was then performing with prodigious success at Goodman’s-fields. The fame of the new performer afforded no pleasure to Quin, who sarcastically observed that “Garrick was a new religion, and that Whitefield was followed for a time; but ‘they would all come to church again.” This observation produced a well-known epigram by Mr. Garrick. In the season of 1742-3, Quin returned to his former master, Rich, at Covent-garden theatre, where he opposed Garrick at Drurylane it must be added, with very little success. 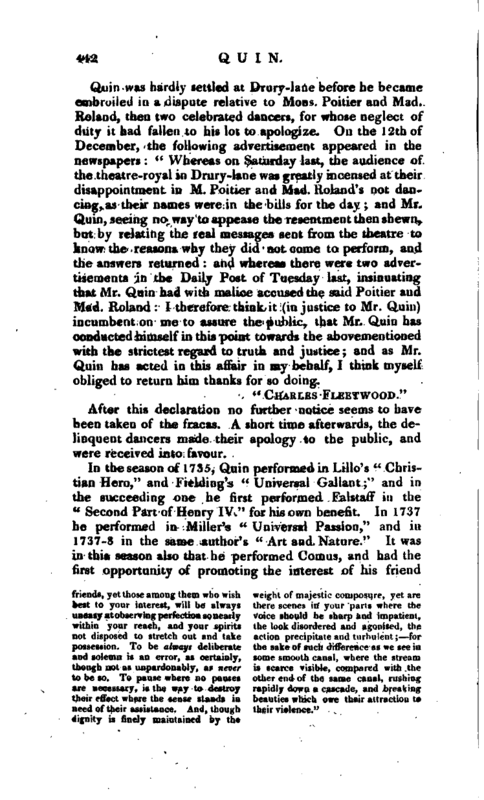 But though the applause the latter obtained from the public was not agreeable to Quin, yet we find that a scheme was proposed and agreed to, though not carried into execution, in the summer of 1743, for them to perform together for their mutual benefit a few nights at Lincoln’s-inn-fields theatre. 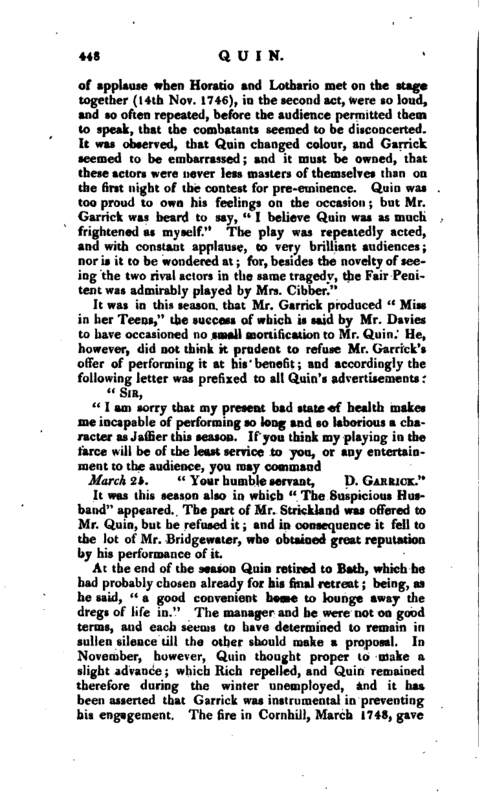 On the failure of this plan, Quin went to Dublin, where he had the mortification to find the fame of Mr. Sheridan, | then new to the stage, more adverse to him than even Garrick’s had been ’in London. Instead of making a profitable bargain in Dublin, as he hoped, he found the managers of the theatres there entirely indisposed to admit him. After staying there a short time, he returned to Londorj, without effecting the purpose of his journey, and in no good humour with the new performers. 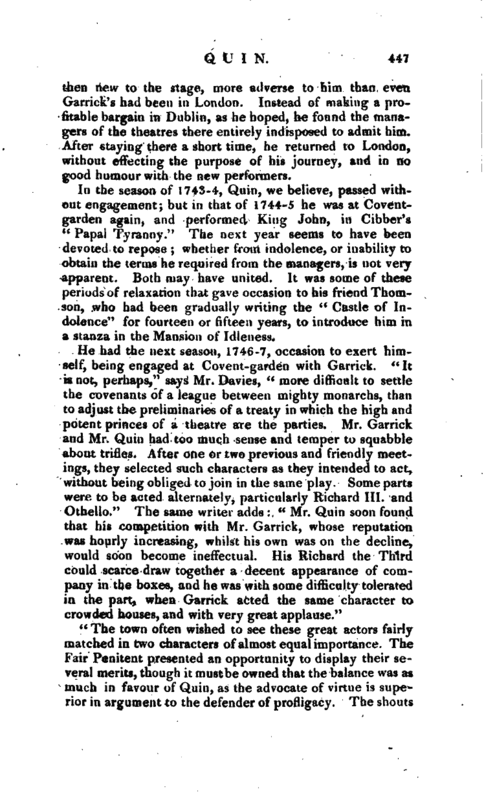 In the season of 1743-4, Quin, we believe, passed without engagement; but in that of 1744-5 he was at Coventgarclen again, and performed King John, in Gibber’s “Papal Tyranny.” The next year seems to have been devoted to repose whether from indolence, or inability to obtain the terms he required from the managers, is not very apparent. Both may have united. It was some of these periods of relaxation that gave occasion to his friend Thomson, who had been gradually writing the “Castle of Indolence” for fourteen or fifteen years, to introduce him in a stanza in the Mansion of Idleness. “I am sorry that my present bad state of health makes me incapable of performing so long and so laborious a character as Jaffier this season. If you think my playing in the farce will be of the least service to you, or any entertainment to the audience, you may command March 25.” Your humble servant, D. Garrick." It was this season also in which “The Suspicious Husband” appeared. The part of Mr. Strickland was offered to Mr. Quin, but be refused it and in consequence it fell to the lot of Mr. Bridgewater, who obtained great reputation by his performance of it. At the end of the season Quin retired to Bath, which he had probably chosen already for his final retreat being, as he said, “a good convenient home to lounge away the dregs of life in,” The manager and he were not on good terms, and each seems to have determined to remain in sullen silence till the other should make a proposal. In November, however, Quin thought proper to make a slight advance which Rich repelled, and Quin remained therefore during the winter unemployed, and it has been asserted that Garrick was instrumental in preventing his engagement, The fire in Cornhill, March 1748, gave | him, however, an opportunity at once of shewing himself, and his readiness to succour distress. He acted Othello at Covent-garden, for the benefit of the sufferers, having quitted Bath on purpose, and produced a large receipt. Soon after, he had a benefit for himself. For the season of 1748-9 he was engaged again, and on the 13th of January 1749 the tragedy of Coriolanus, by Thomson, who died in the preceding August, was brought out at Covent-garden. Quin, whose intimacy with him. has been already mentioned, acted the principal part, and spoke the celebrated prologue, written by lord Lyttelton. When he pronounced the following lines, which are in themselves pathetic, all the endearments of a long friendship rose at once to his imagination, and he justified them by his real tears. No words can speak it but our tears may tell. The next season opened with a very powerful company at Covent-garden, and it is said that Garrick endeavoured, but in vain, to detach Quin from that house. His benefit was Othello, in which, for that night, he acted lago, wTiile Barry took the part of Othello. This was on the 18th of March 1751, only three days before the death of his patron the prince of Wales and the house, notwithstanding the novelty arising from the change of parts, was thin. On the 10th of May he performed Horatio in the Fail- Penitent, and with that character concluded his performances | as a hired acton He now carried into execution his plan of retiring to Bath, but visited London in the two succeeding seasons, to perform Falstaff for the benefit of his old friend Ryan. 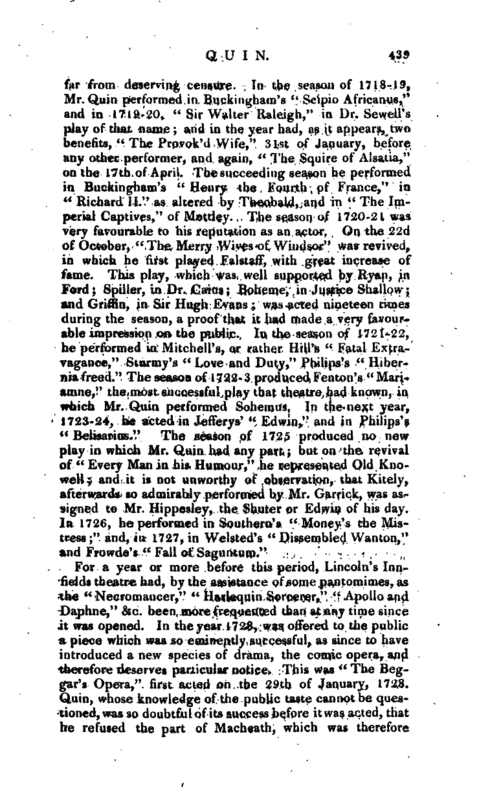 The last time of his appearance on the stage was the 19th of March 1753, on which night the stage, pit, and boxes, were all at the advanced price of 5s. The next year, finding himself disabled by the loss of his teeth, he declined giving his former assistance, saying, in his characteristic manner, lt I will not whistle Falstaff for any body but I hope the town will be kind to my friend Ryan they cannot serve an honester man." He exerted himself, however, to dispose of tickets for him, and continued his attention to the end of Ryan’s life. 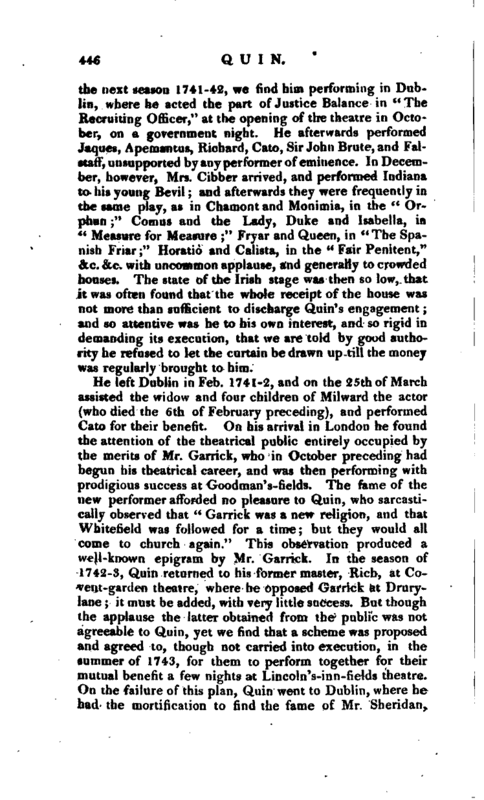 Mr. Davies says, in hi* Life of Garrick, that to make up the loss of his own annual performance, he presented his friend with no less a sum than 500l. "Mr. Quin was a man of strong, pointed sense, with strong passions and a bad temper yet in good-humour he was an excellent companion, and better bred than many who valued themselves upon good-manners. It is true, when he drank freely, which was often the case, he forgot himself, and there was a sediment of brutality in him when you shook the bottle; but he made you ample amends by his pleasantry and good sense when he was sober. 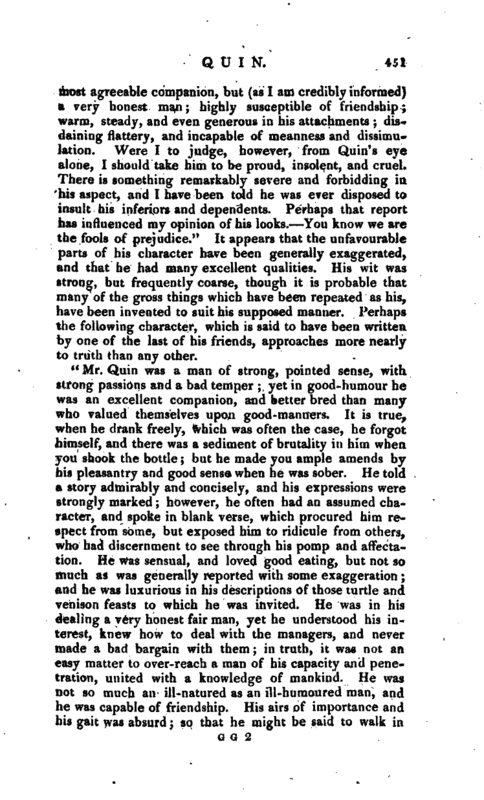 He told a story admirably and concisely, and his expressions were strongly marked; however, he often had an assumed character, and spoke in blank verse, which procured him respect from some, but exposed him to ridicule from others, who had discernment to see through his pomp and affectation. He was sensual, and loved good eating, but not so much as was generally reported with some exaggeration; and he was luxurious in his descriptions of those turtle and venison feasts to which he was invited. He was in his dealing a very honest fair man, yet he understood his interest, knew how to deal with the managers, and nevef made a bad bargain with them in truth, it was not an easy matter to over-reach a man of his capacity and penetration, united with a knowledge of mankind. He was not so much an ill-natured as an ill-humoured man, and he was capable of friendship. His airs of importance and his gait was absurd so that he might be said to walk in | blank verse as well as talk but his good sense corrected him, and he did not continue long in the fits. I have heard him represented as a cringing fawning fellow to lords and great men, bat I could never discover that mean disposition in him. I observed he was decent and respectful in high company, and had a very proper behaviour, without arrogance or diffidence, which made him more circumspect, and consequently less entertaining. He was not a deep scholar, but he seemed well acquainted with the works of Dryden, Milton, and Pope and he made a better figure in company, with his stock of reading, than any of the literary persons I have seen him with. 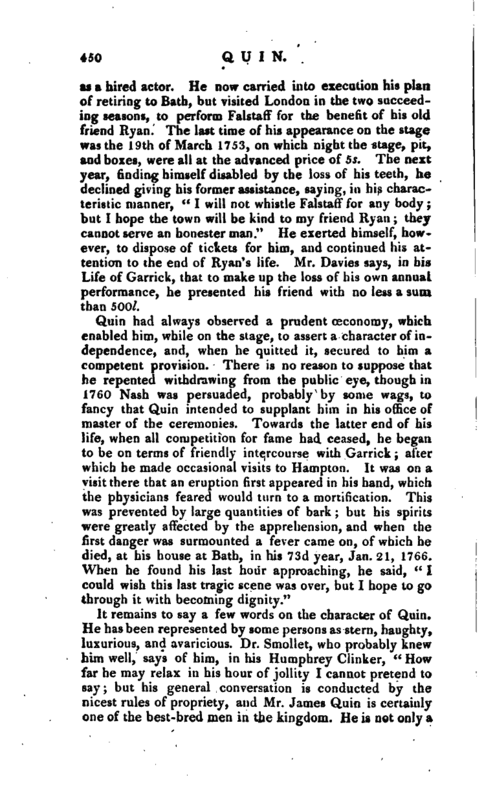 Life of Quin, 1765, 8vo Davies’ Life of Garrick, &c.